Yes, the 2012-2013 season hasn't even begun but it is time to look towards the future. No, not another preview of this upcoming season. I'm thinking about the recruits that will make a difference in 2013-2014. Parker has been hailed as the top forward prospect since LeBron James so its no surprise he is the top prize in the recruiting show. He is from Simeon High in Chicago, a powerhouse in Illinois. BYU, Duke, MSU, Stanford and Florida have all offered him scholarships. Parker is versatile as he can play power or small forward and even spend some time at guard because he handles the ball great. He'll be the recruit of the century for a number of schools if they can land him. The next one and done point guard, or guards at Kentucky? The Harrison brothers who will probably start immediately for Calipari. Andrew is the more talented one, as many have him number two on their recruiting boards. Andrew will run the point with his brother handling the small forward position. Both are extremely athletic and will remind a ton of Wildcat fans of the days of John Wall. 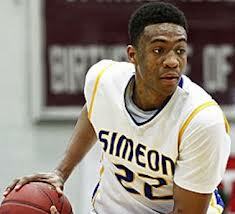 If Jabari Parker wasn't in this class Randle would be the no-question top forward in this class. He is athletic and has a great mid range with a great motor. He has visited Florida and Kentucky and if he chooses one of those could make that school's class best in the land. He is from Texas so don't count out the Longhorns or Jayhawks for that matter. The top recruit, out west it seems Gordon is destined to stay out there. From San Jose, Gordon is a smart possibly dominat player who's size allows him to spend time at multiple positions. He has visited a number of schools out west including Arizona and Oregon but don't think Calipari and the Wildcats are out of this race yet. Billy Donovan landed yet another talented guard when he managed to reel in the talent from Eustis, Florida who has the smarts and potential to smart immediately. The speedy Hill is perfect for any high paced offense and is a fantastic finisher. Other than the Harrison brothers he was likely the top pickup in the SEC (assuming Randle doesn't go to Kentucky and either does Gordon). Arkansas has a great future ahead of them after pulling in the talented forward from Hall High in Little Rock. Portis is very versatile as he can do damage on the perimeter as long as down low, keeping defenses guessing. He is basically guranteed to be playing in the NBA some day.